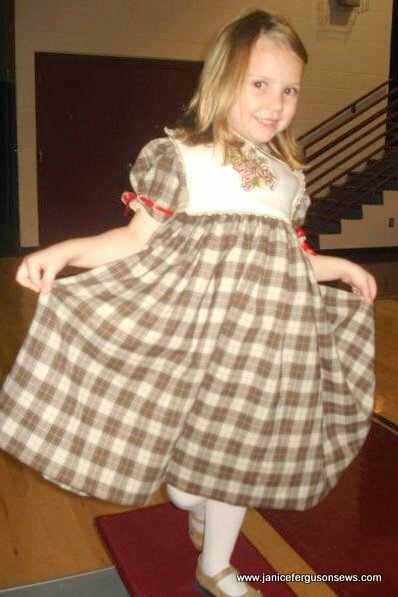 Made 11 years ago,this first birthday dress was for now 12 yo granddaughter Laurel. Of course, I still love sewing for her. It’s birthday time for our older granddaughter, Laurel, so I’ve been spending some time reminiscing about her birth and infancy. So here is a re-run of a post about her first birthday dress. 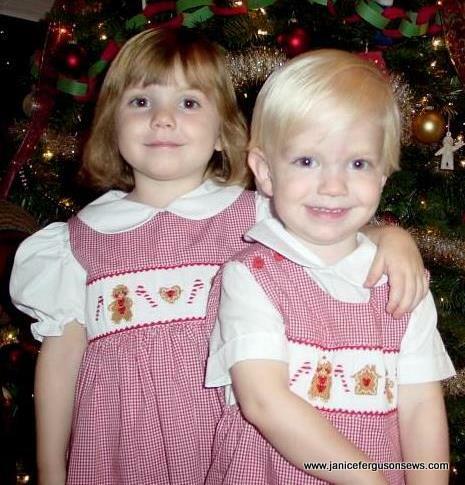 Laurel was our first grandchild, and a girl at that. Our son had been married for 9 years and our daughter was still a single career gal. 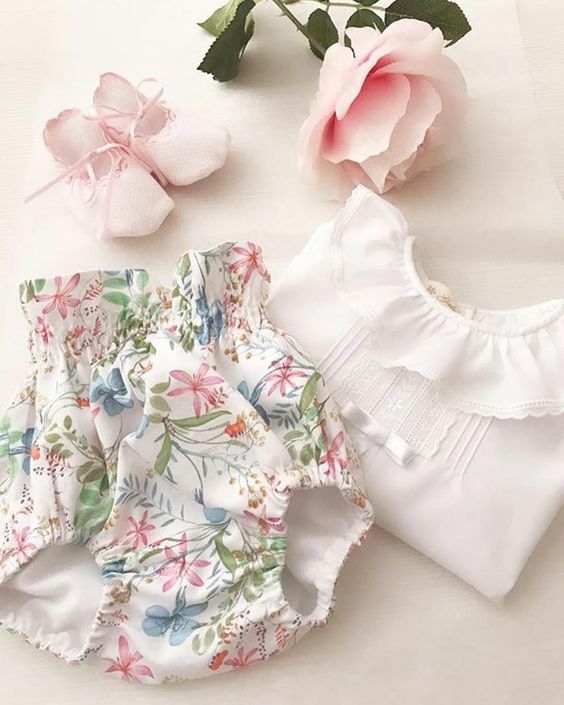 After nearly 15 years of Granny Lust, mitigated only by gathering fabric, patterns and trims for my Grandmother’s Really Hopeful Chest, I was ready to sew as a genuine Nana. That first year went by so quickly! 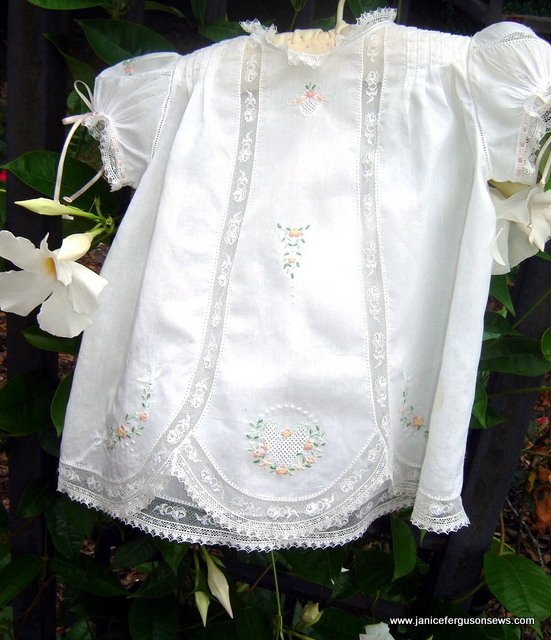 Smocked daygowns and bonnets, embroidered diaper shirts and onesies, monogrammed bibs and baby Gator duds flew out of my sewing room. It seems that for almost 12 months, I did nothing but sew and snuggle that baby. The bassinette skirt I’ve been working on is coming along, but it surely takes a lot of time to arrange the designs. 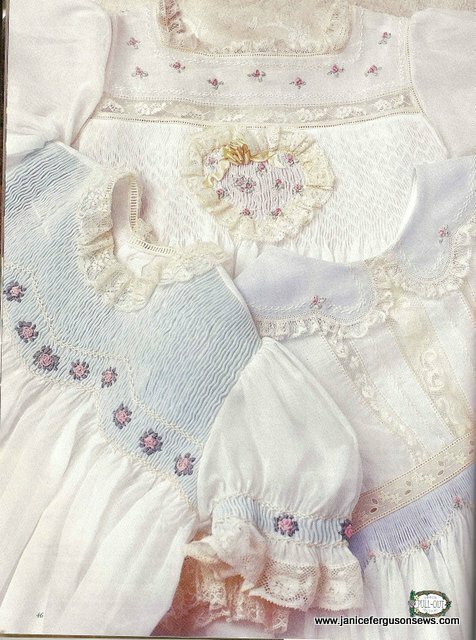 So while I continue working on that, I thought you might enjoy looking at this sweet baby dress which has so many exquisite details. It was given to me by a friend but she knew nothing about its history or origin. The fabric seems to be a soft organdy, if there is such a thing. It may just be that it’s old and has lost some–but not all–of its crispness. Labeled Tiny Tots Originals hand made Philippines, every stitch is done by hand. I googled Tiny Tots and could only find references to a company by that name in the garment district of New York City. 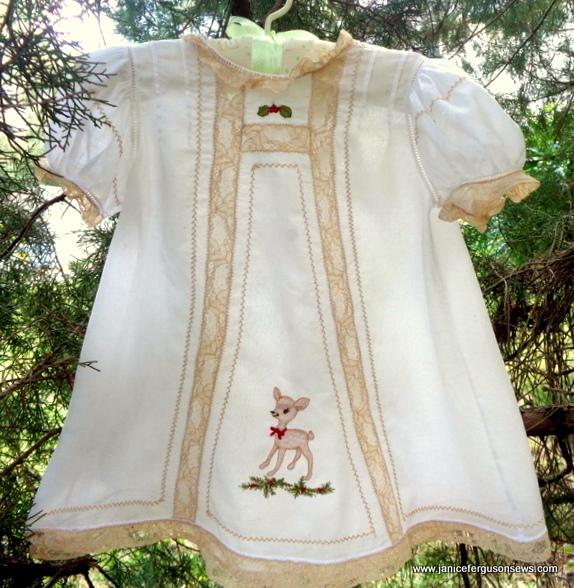 The search also turned up other Tiny Tots Original garments for sale on etsy or eBay. The information is not corroborated, but those garments were dated 1940-1960, though every vendor seemed to be giving it their best guess. Note: This was posted some time ago, but I have 2 year old Alastair underfoot and there is no time. It’s 11 p.m. and he just went to sleep!#$%*! His parents are out of town so we have our sweet grandson for four days. There is a reason why God gives babies to the young! This is one of my favorite projects. It’s not really a modern project for this old fashioned Nana, but it could have been! 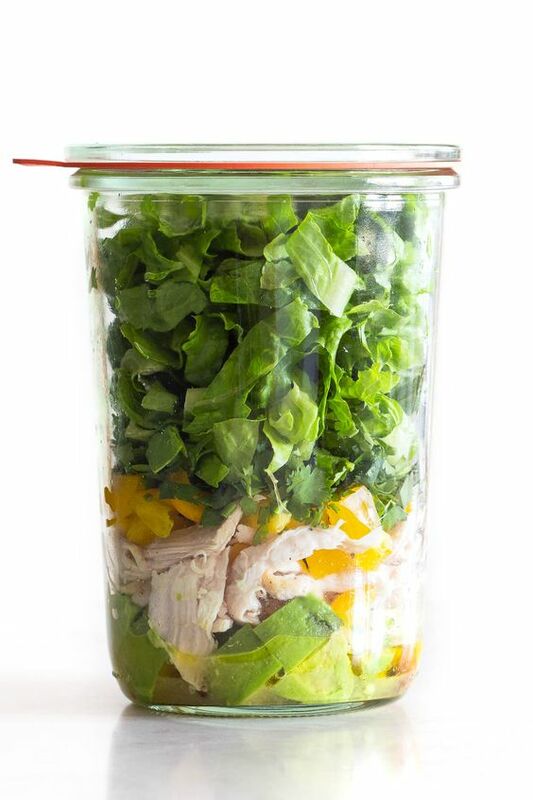 With only a few changes, this dress could be easy care. 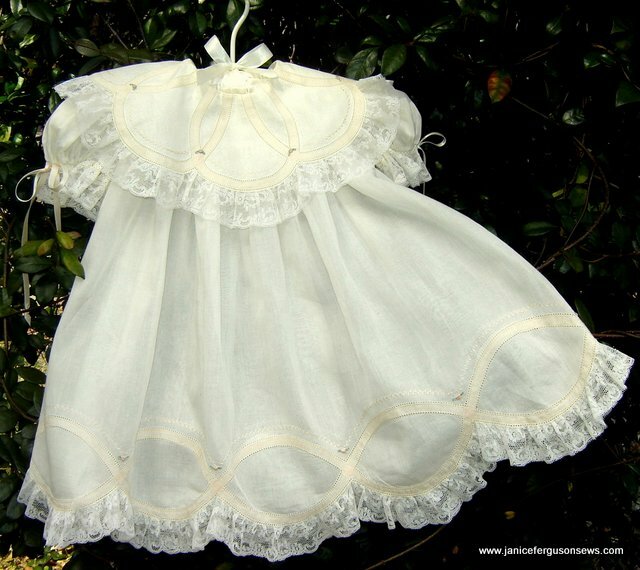 As a matter of fact, if my daughter gives us another granddaughter in the next few years, I will probably make an easy care version of this frilly frock. I’ll detail my suggestions for a wash-and-wear version at the end of this post. There is a lot to love about the dress: Chery Williams graceful Wedding Ring Dress pattern, Capitol Imports champagne Swiss batiste, champagne Swiss beading, peach lace tape, miles of hemstitching, both pinstitch and entredeux, and a nylon French lace which requires almost no ironing. The pattern calls for lace insertion and is beautiful when made up as directed. But my infatuation with lace tape and an urge to market this product which I developed led me to use it rather than lace. 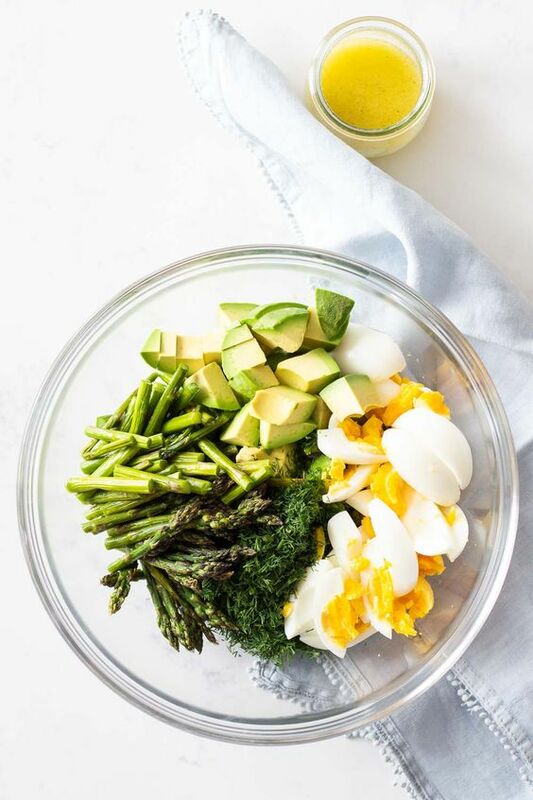 There are several advantages of this substitution. One is the addition of soft color to the monochromatic palette of the champagne fabric, beading and lace edging. Another advantage is that the foundation fabric need not be cut away behind the lace tape, as is normally done with lace insertion. By leaving the fabric intact, the structural integrity is not compromised. 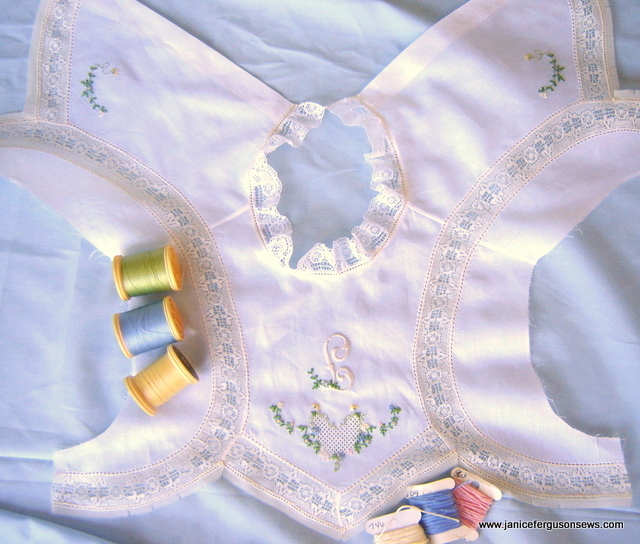 This makes the garment much sturdier and less likely to tear when there is stress on the fragile lace. 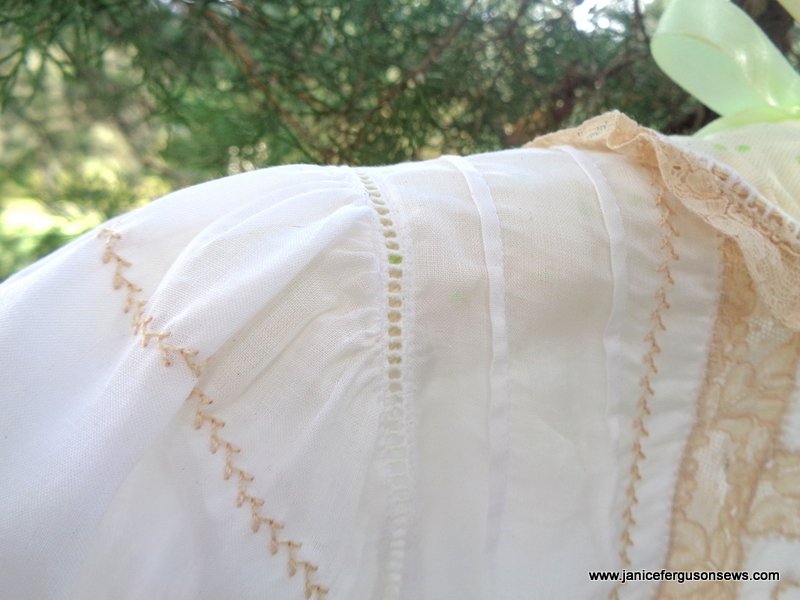 Yet another advantage is that lace tape is far less expensive than heirloom lace. 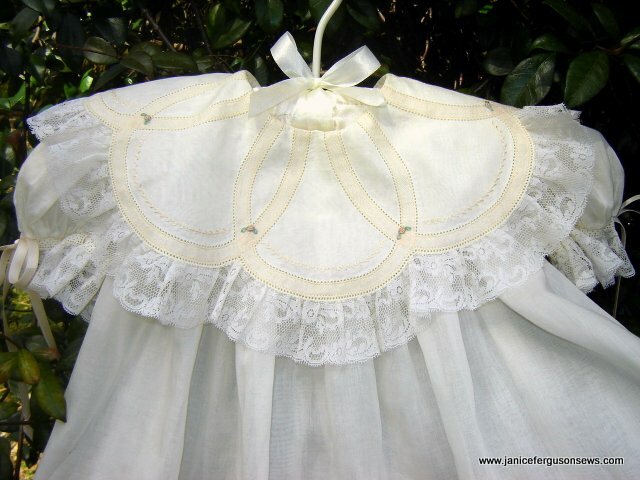 And yet, lace tape meets many of the heirloom characteristics: it is imported, 100% cotton, has pull threads on either side for shaping and is of fine quality. I did have some trouble with the collar pattern. Mine is an old version and it may have been revised by now. But placing the lace or lace tape on the line indicated allowed no space whatsoever where the rings overlapped. So I redrafted the collar pattern and then all was well. This dress shows quite clearly the difference between the pinstitch and the entredeux stitch. 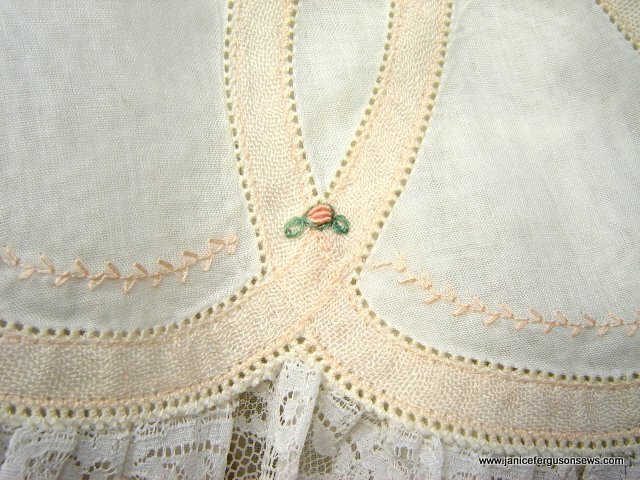 The top of the lace tape ovals or “footballs” at the hem and the rings on the collar were pinstitched. At the bottom of skirt, which was straight with the footballs hovering above, the entredeux stitch was worked. 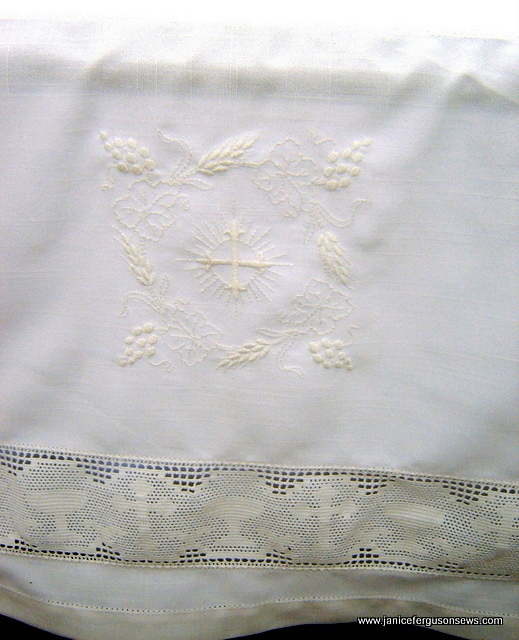 Next the fabric was cut right to the edge of the entredeux stitches, just as is done with commercially made entredeux. 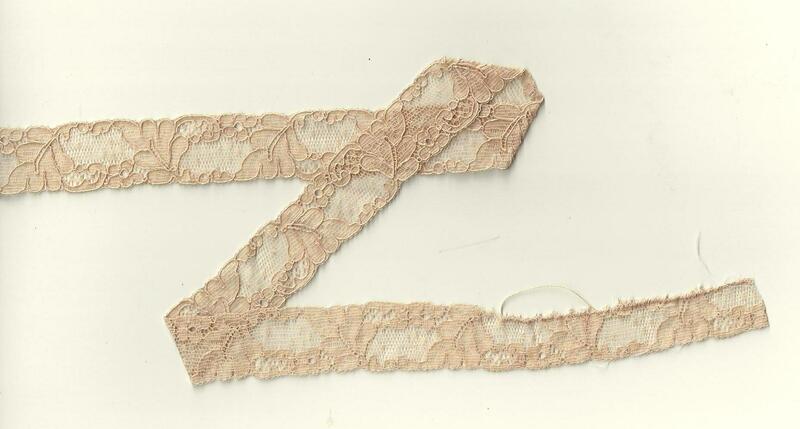 The gathered lace was then butted up against it and joined with a tiny zig zag. 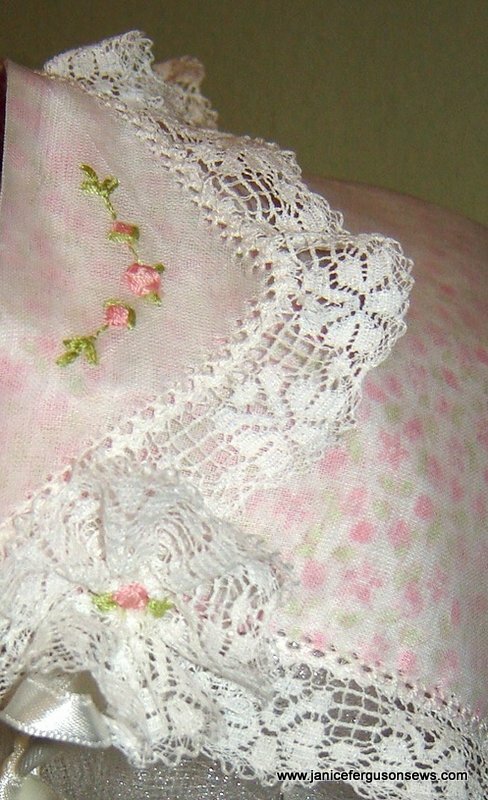 The collar was worked in the same manner, with entredeux worked only on the bottom where lace edging would be joined. The lace is one of my dearest treasures. Mr. Russell, owner of the renowned lace wholesaler M.E.Feld Co. in New York City, always generously shared his wealth of knowledge about the kinds of lace and its history. Without fail, he patiently answered my multitudinous questions as I placed my order. It was his practice to send customers a huge box of lace from which to choose. The unwanted lace was then returned, though in my case almost none of the lace was “unwanted” but simply over budget. In one of these boxes, which usually put me into a state of hyperventilation, there was a bolt of lace, wrapped on a blue card and marked “Made in France,” just like the others. But this one read “100% nylon.” What? Mr. Russell explained that these were called “levers” lace (though I have since seen it spelled “leavers”) and were just as fine as the cottons, but intended for lingerie or other items which would be subjected to heavy and/or frequent laundering. 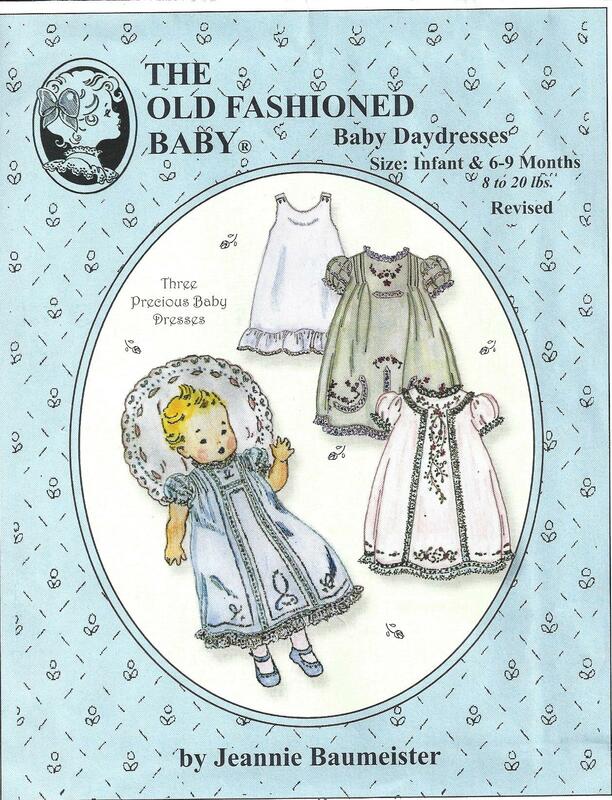 Now, this is something with which I could build an entire wardrobe of easy care heirloom clothes! I wish I had bought more. As you can see, this galloon has no gathering thread. I simply butted 30 wt. cotton thread to the picot edge and did a tiny roll and whip over the thread. This gathered the lace perfectly. I have a few pieces of such lace, but this is my favorite. It is technically a galloon, with a decorative edge on both sides. But the pattern is straight enough that it also can be used as edging or insertion. The color is a true ivory and works just as well with white as it does with the champagne color. 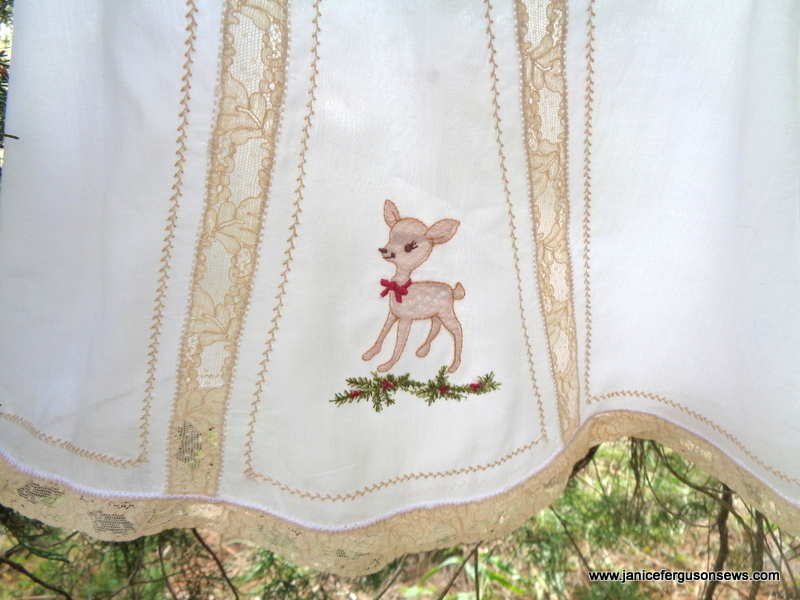 When the dress was new, there were no hand embroidered bullions. I didn’t have time and kept putting it off. But the dress cried out for something more and I was much happier with it after I had finally done this. Now, I wish I had used more bullion knots to make a prettier rose, but the effect of this rose is certainly is better than nothing. The web rose in the entredeux vine has its spokes laid down in the design. Several strands of thread are twisted then woven around the spokes. This is much easier and quicker than a hand embroidered bullion rose. Even a hand stitched web rose requires time to lay down the spokes. If it had been available at the time, Suzanne Sawko’s web rose in the machine embroidery collection Fil Tire’ and Fancywork Elements would have been used. The dress would not have been plain Jane for so long. Using the machine embroidery would have taken this dress into the realm of “modern projects” for this old fashioned Nana. By substituting rice colored Imperial batiste for the champagne Swiss and using the same lace, the dress would have been easy care. 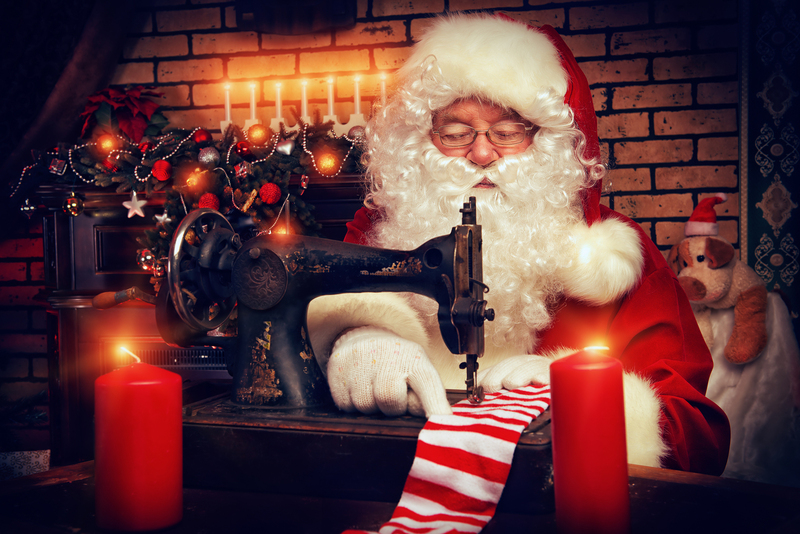 With the polycotton blend fabric the hemstitching would have to be eliminated. But a narrow zig or machine feather stitch would give a satisfactory look. 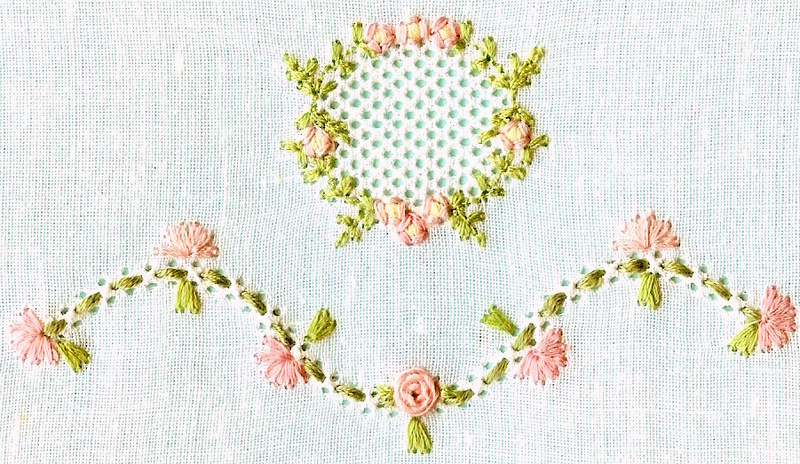 Adding the embroidery machine worked web roses would be the finishing touch for a thoroughly modern heirloom. This “old fashioned Nana” is getting excited thinking about making up this “modern project!” Maybe that could be a later White Wednesday post. In desperation, I’ve tabled all my to-do’s and should-do’s then surrendered to MUST-do, which is sewing. Not only is Easter just around the corner, but also I am in serious need of a powerful sewing fix. So I’ve retreated to my textile cave, AKA Sewing Machine Garage and Stash Storage Facility, for needle and thread therapy. If ever I were to fall seriously ill, I’m pretty sure an heirloom sewing session would cure me. Laurel is first in line for Easter finery. Handling Swiss batiste, heirloom laces and stitching embroidery does for me what baby cord and Imperial broadcloth cannot. Those items, by the way, are the components of the grandsons’ outfits that I have planned. Since Judith Dobson’s Tea Dress appeared on the back cover of Sew Beautiful in the January 1989 issue, I’ve wanted to make this beauty. 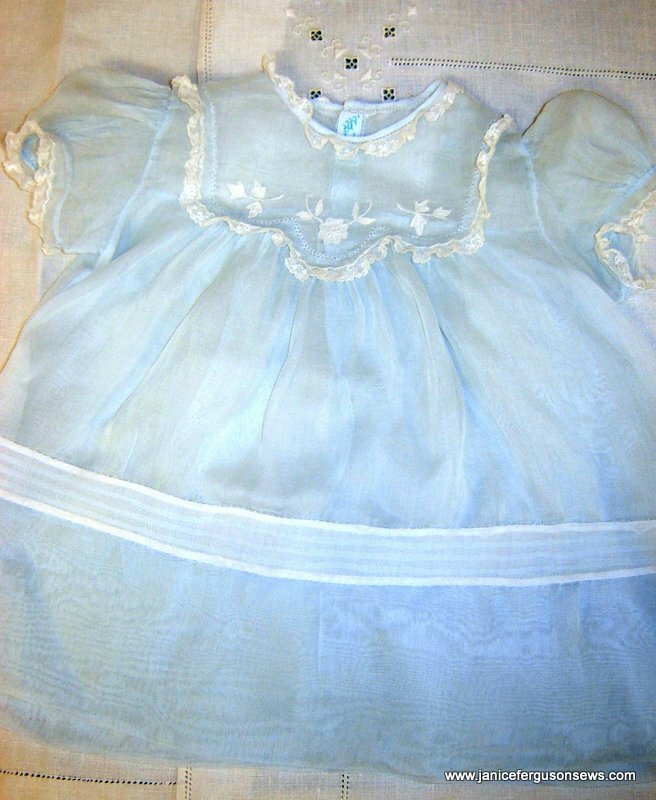 At the time, my Rebecca was already 14 years old so I knew that making the Tea Dress was not a project I would take on in the foreseeable future. Here I am, so busy I can hardly find time to comb my hair. Meanwhile, granddaughter Laurel has been waiting somewhat patiently for the smocked nightgown I’ve started for her Molly doll. Finishing this nightie has been an urgent request of Laurel’s because, she tells me, “Molly has to sleep in her CLOTHES, Nana!” Outrageous, I know. If there were a DPS (Doll Protective Services) agency, Laurel would be panicked. 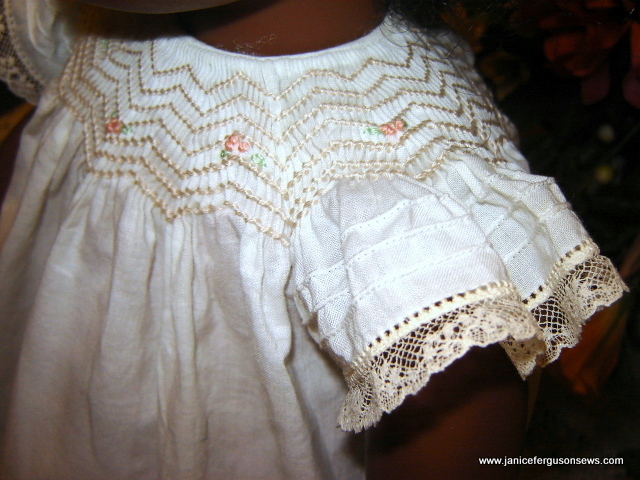 But yesterday I came across a stash of doll clothes I made many years ago and, whoopee! they fit the American Girls dolls! They were projects for doll schools that Mildred Turner and I organized and taught around the country some years ago. 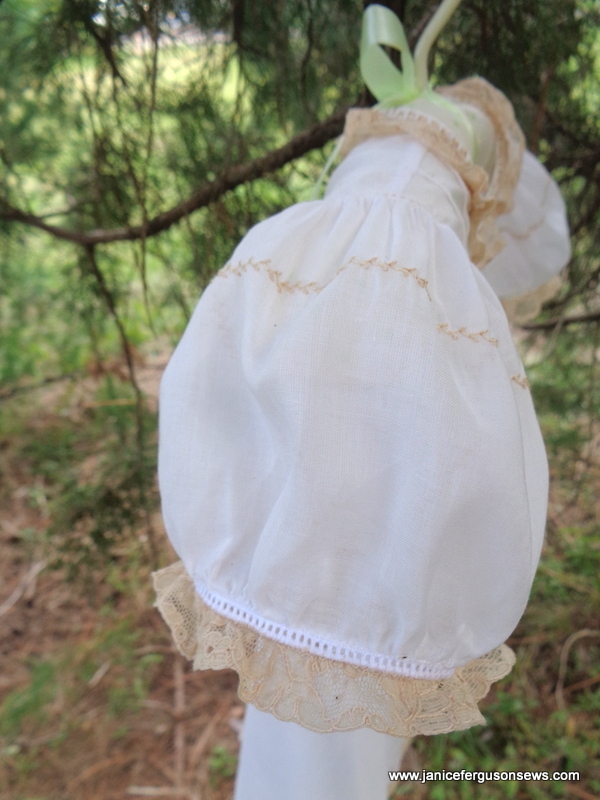 In these schools, students sewed a wardrobe that Mildred and I had designed for 20″ porcelain dolls. 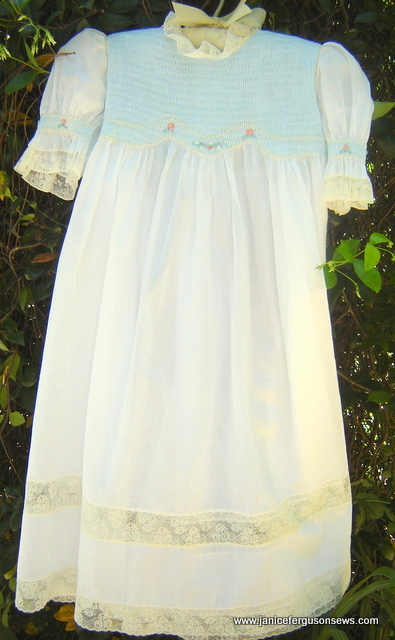 This, I think, was the nightdress for Melanie, our Gone With the Wind character doll for the Atlanta school. What fun we had at those schools. 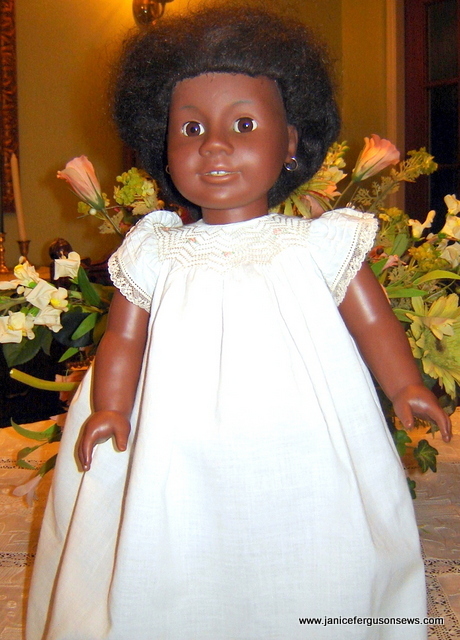 At any rate, the bias bound neck is a little snug and the gown touches the floor on the 18″ American Girls dolls, but Addy is not complaining. 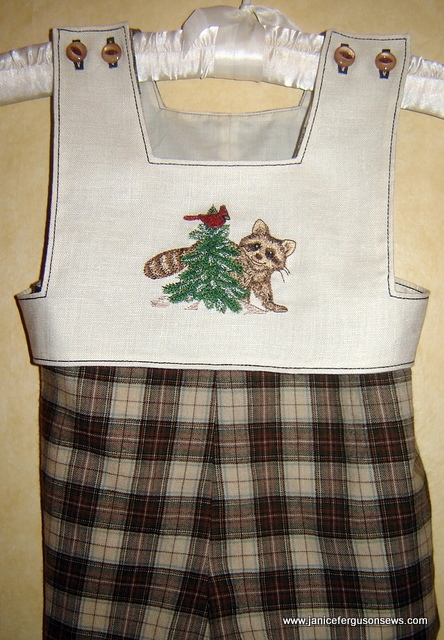 Another class project for Sewing at the Beach is finished along with the kits and handouts. 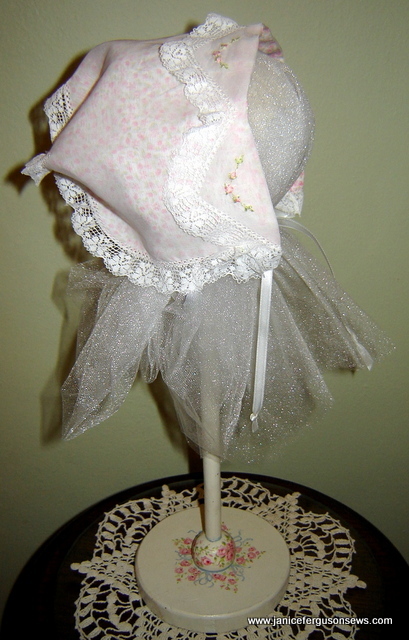 This Swiss organdy zig zag bonnet is a summer version of the Swiss flannel bonnet featured in an earlier post. Appearing in Creative Needle magazine many years ago, the 1920’s pattern has always intrigued me. That recreation was made of a single layer of Swiss batiste. Working with the organdy was such a pleasure. Having modified the pattern to include a lining, I was pleased to see the delicate lawn print peeking through the organdy. It is much more visible than it is through the Swiss flannel. Additionally, the organdy required no starch before hemstitching. This is a bonus in a classroom situation. 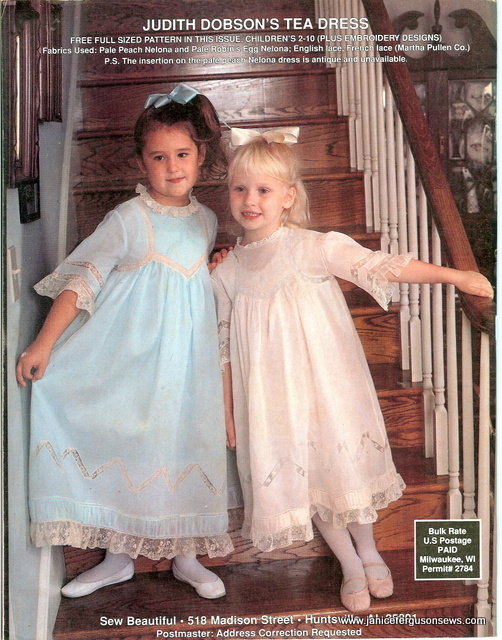 Basically, the pattern consists of a single piece of batiste 15″ X 9″ with deep zig zags along the front and back. This measurement allows a little excess around the edges for hemstitching. I was not surprised at how difficult it was to trace the pattern onto the organdy. It would have taken too much time in class, so I used a technique that has worked on other projects that require tracing. 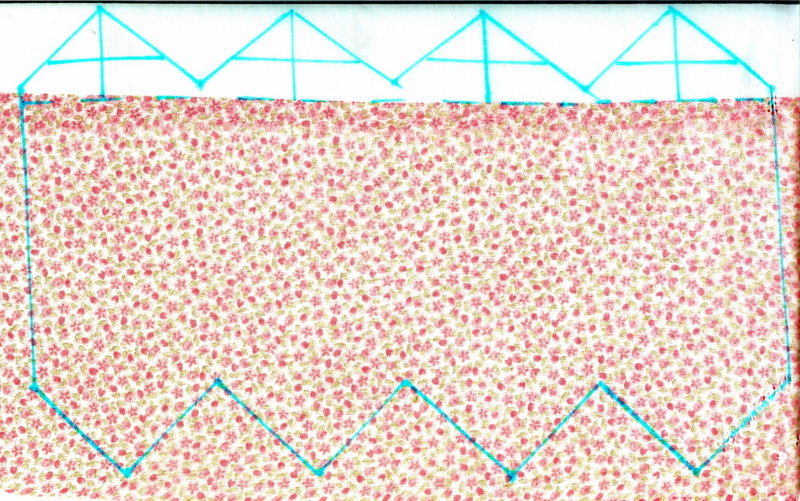 First, I taped the paper pattern to the cutting board. Then, a sheet of quilting template plastic was placed over that and also taped to the cutting board. Next, several lengths of double sided tape (my absolute favorite, must-have non-sewing notion) were placed around the perimeter of the pattern and through the center. Finally, the organdy was pressed against the tape and smoothed flat. Not only does this prevent shifting of shifty fabric, but it also prevents the possibility of transferring some of the ink from the pattern onto the fabric when the marking pen traces over it. And it is so much more accurate than tracing over unruly fabric. 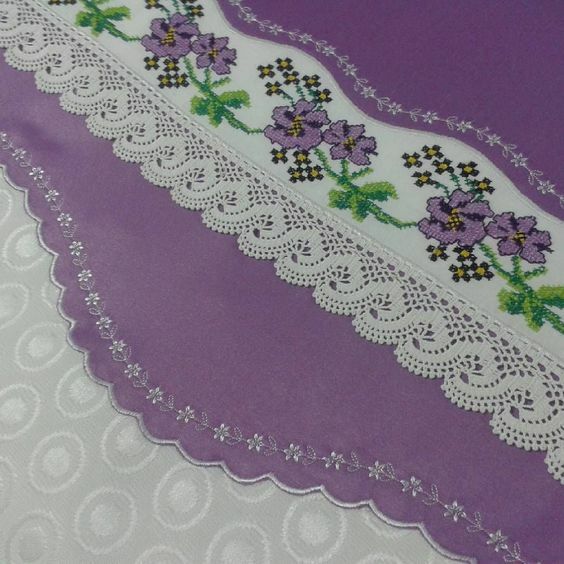 If you would like this wide V floral machine embroidery design, post your request as a comment below. 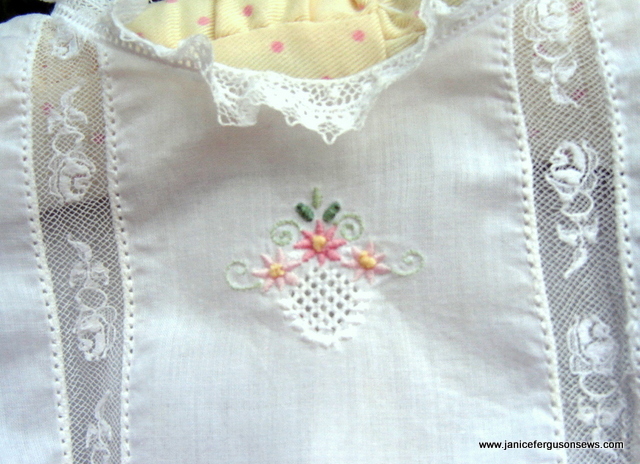 The machine embroidery within the front points is from Fil Tire’ and Fancywork Combinations collection. Lining is joined to the organdy with spray adhesive up to the brim fold line. Machine made entredeux outlines the perimeter and slightly gathered English lace edging is butted up to it. Lace edging is joined all around. 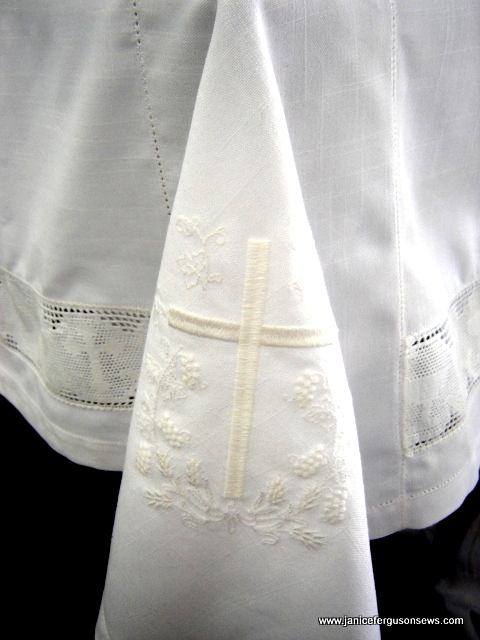 The embroidered points are folded back to serve as a brim and the back zig zags are tacked together. Ribbons can be attached quite simply at the sides. Machine embroidered lace rosettes to cover the ribbon stitching takes a little more time but I was pleased with the results. Five inches of 3/4″ edging was machine zig zagged together. By pulling the gathering thread from both ends, I had more than 2″ of sturdy header thread to knot off, holding the rosette’s gathers. Still, there is a small hole in the center. Water soluble stabilizer was hooped in my smallest embroidery frame. 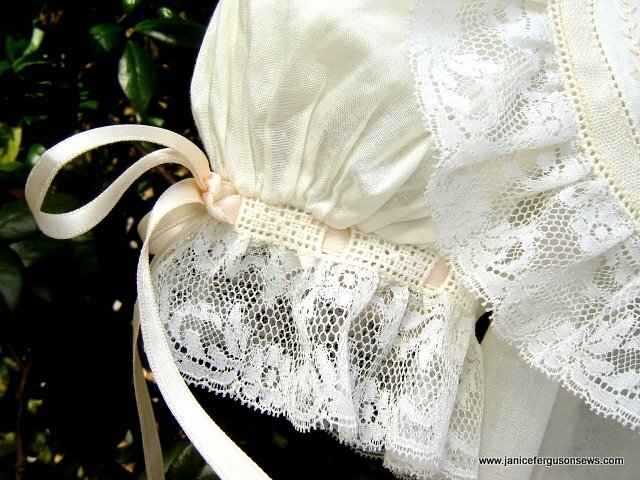 With spray adhesive, a scrap of white lace was placed against the rosette, over the hole. Then, with another application of spray adhesive, the lace rosette was placed on the stabilizer. The carefully selected design was sized to reach beyond the little hole in the center of the rosette. I love baby bonnets. 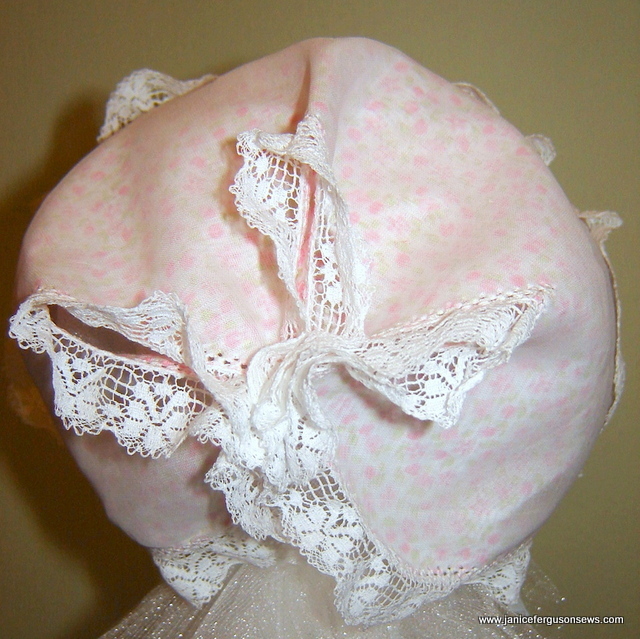 What is your favorite bonnet pattern?